Screencap from Leo K’s video of the newly-discovered message. A game as popular as October’s Assassin’s Creed Origins is usually wrung free of major surprises by the time it’s been out for four months. That’s why some fans were startled last week to discover that Origins contains a previously unknown, new audio message from the Isu, a mysterious ancient civilization that is part of the series’ deeper lore. 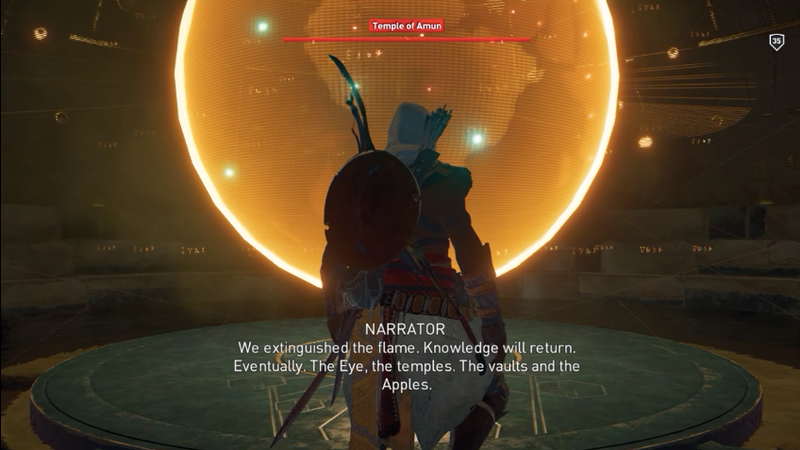 The message is triggered if players enter a vault in a cave in the hometown of the game’s lead protagonist, Bayek, though it only plays during a narrow window of opportunity late in the game (you can only access it near the end of the game’s story and then can’t once the story is complete). A voice speaks mysteriously about “the Eye” and “temples” and “the Apples.” The short speech is as esoteric as the handful of other previously discovered Isu monologues in the game. It has taken on additional intrigue because it was only found in the game last month. Here they are, awakened from their slumber. One by one....so many... A library. A repository. We extinguished the flame. Knowledge will return. Eventually. The Eye, the Temples. The vaults and the Apples. Until then, how much benighted use will this power serve? It may take ages until your kind becomes enlightened. Who stands in this chamber? At long last, a light has been cast. But I fear your blood is the thickest of shadows. NightmareT12 and other fans discussing this discovery on the Assassin’s Creed subreddit last week theorized the voice line was added to the game after release, which raised new questions about why Ubisoft would have added it after all that time. Turns out the fact that it wasn’t there was the real problem. It’s unclear how an audio message recorded for the game could be “missing” at launch, and we asked Ubisoft for clarification about how and why that happened. They’ve not been able to offer more detail about that yet. The idea that it was always supposed to be in the game may dampen some of the excitement about the discovery. In early 2017, Ubisoft added a short exchange of dialogue to the end of Watch Dogs 2 via a post-release patch, a possible tease to an England-based sequel, though the company has never confirmed that. There does not appear to be as tantalizing a motive for the added message in Origins. It’s just some clean-up. And maybe, for fans desperate for the series to continue to acknowledge the meta-story outside of the shifting historical setting of each Assassin’s Creed game, it’s a sign that the developers still want to feed some of that hunger, too. YouTuber Leo K recorded a video that shows how to reach the added Isu message. Listen to the message and see if you can decipher what it means regarding the AC series. Note that the video contains late-game spoilers, since the message can only be accessed near the end of the game’s campaign (but, maddeningly for those who missed it), not once you’ve finished the campaign. “Isu stuff is one of my favorite parts in the series, ever since you entered the Vatican Vault in [Assassin’s Creed II] and Minerva passes the message,” NightmareT12 said, referring to some of the sci-fi twisting that happened early in the series. He added that the Isu chambers and messages in the new game made him “really happy” because they also signaled that the game was building up a connection between the ancient Isu and Origins’ modern-day character Layla, who players can control during a small portion of the game. The Isu and modern day lore are not the most uniformly popular parts of the Assassin’s Creed series. Their presence has been diminished in recent games. For a fan like Nightmare12, even these tiny tastes of it in Origins are enough to inspire theories and raise hope that what they still crave in an Assassin’s Creed game is still part of the formula going forward—even if, for some reason—part of that formula isn’t mixed in until months after release.